“Barry” a film directed by Vikram Gandhi and starring Devon Terrel and Ashley Judd, is the story of a young bi-racial man who calls himself Barry, who comes to New York City in 1981 to study at Columbia University. The film has premiered on Netflix. Barry is somewhat confused about his personal identity, having a father whom he has not seen in a long time from Kenya and a mother, who is more interested in anthropology than child rearing, from Kansas. He has lived some of his childhood years in Indonesia and has soaked up some of the culture of that Muslim country. He will later be known to history as Barack Obama, president of the United States. Of course, the “hope and change” election of 2008 and the tumultuous years that followed are years in the future. 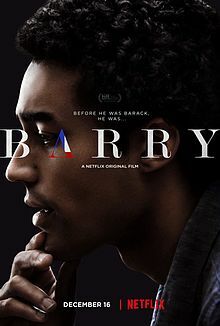 The movie focused on how Barry became Barack and the people who helped him get there. They include Charlotte, a white girlfriend who is a composite character, a bigoted cop who questions his right to be where he is, and a bookstore owner who introduces young Barry to the works of leftist authors such as Ellison and Du Bois, according to a review in the Chicago Tribune. Ashley Judd shows up as Barry’s mom, Ann Dunham, the radical leftist student who conceived the future president of the United States in the arms of another student, a ne’er do well from Kenya with aspirations of being a revolutionary. Dunham would be an interesting character even if she had not birthed the 44th president in 1961. The period of the movie, at the beginning of the Reagan 1980s, is coincidental but crucial to understanding the young man who will become president. Reagan was a different a president as Obama would come to be as any man in history. Obama would come to believe that he would be as transformative in his own way as his predecessor, albeit in the opposite direction. “Barry” has received mainly positive reviews. It also is the second Obama biop to become a feature motion picture, the first being “Southside with You,” an account of how the young Obama met the future first lady. Having not one but two biographical films released when the administration of a sitting president has not yet finished is almost unprecedented. The only other example that comes to mind is “PT 109,” a film that celebrated the war time exploits of President John F. Kennedy, released five months before he was assassinated.